SO, you’ve opted for a lung shot. Good choice. But where exactly you should place your bullet depends on your quarry, as the following tips reveal. (Please refer to the organ legend) Sometimes you only get one chance to bring down a big-game animal. Here are 7 ways to help make sure it truly counts. Avoid the head-the target is too small and you’ll ruin the best part of your fireplace rug. You’ll also render your bear ineligible for official scoring. As for spine or neck shots, it can be difficult to visualize exactly where to find the spinal column thanks to the bear’s long hair and thick body. Again, lung shots are your best bet. Trace the back of the front leg up to about one-third of the way into the chest. 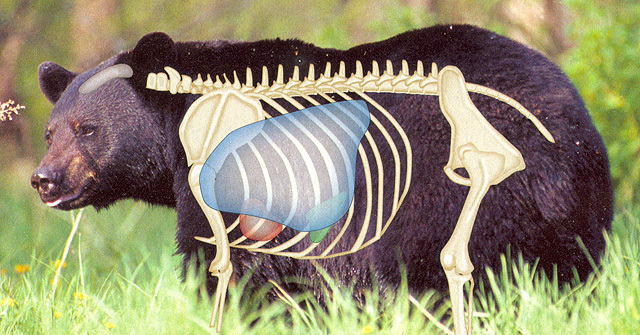 The lungs on a bear are positioned a little more forward than on an ungulate, so you don’t have as much leeway if you shoot back of your aiming point. 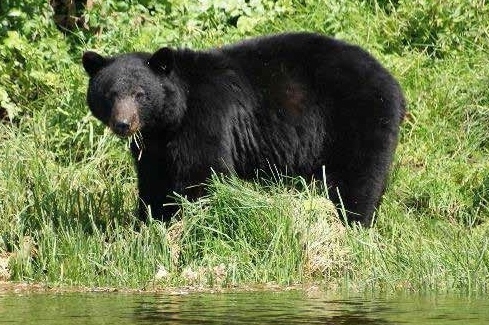 For the shoulder/heart shot, which is popular for anchoring bears in their tracks, follow the centerline of the front leg up to the one-third point of the body. Be careful not to shoot low or forward, or you’ll quickly have a wounded animal on your hands. WOUNDED and lost big game animals are part of the somber side of hunting. None of us is comfortable with the subject, but if you have any measurable hunting experience, you’ve undoubtedly seen examples. Maybe you’ve even lost an animal or two yourself. It’s a certainty that as long as there’s hunting, game will be wounded and not recovered. In such situations, it’s just as certain that the bullet didn’t hit the animal in the right place. Why exactly can be blamed on any number of variables, but in most cases it’s safe to say the shot should never have been taken in the first place. As hunters, our most important priority is to do everything possible to ensure a clean, quick, humane kill-it’s our moral obligation every time we head afield. Here are some important considerations in making that happen. Much has been written and discussed about selecting the best rifle, cartridge, bullet and optics for hunting specific species under various conditions. Most of this advice is sage indeed, helping hunters learn about and understand the limitations of their equipment. But when it comes to a quick kill, the single most important factor is bullet placement. A .243 in the heart or lungs of even the largest big-game animal, for example, is more certain to result in its demise than a .500 Nitro Express in its leg. Just think of hunting legend Karamojo Bell. It was his fanaticism over bullet placement coupled with an understanding of his quarry’s anatomy-that allowed him to tale down so many elephants with his meager .275 Rigby, a cartridge equivalent to today’s 7×5 7. The first step in ensuring accurate bullet placement comes with the decision to squeeze the trigger. Before you hit the switch, you must have an extremely high expectation of putting the bullet right where you want it, and that means understanding your own limitations as a marksman. I’ve never been much impressed by tales of 450-yard kill shots on deer or other game. While such shots are possible, not many hunters can make them with any consistency. With few exceptions, I shudder when I hear hunters talking about their long shots-much like a gambling addict bragging about his one win, for each tale of success there are likely tenfold as many unspoken failures. The longest shot I’ve ever taken was with a 7mm Rem. Mag. on a five-point bull elk in B.C.’s Muskwa Valley. It was 360 yards away. I had a solid rest, a reasonable amount of time and a mild, though gusting, wind. The bull was dead when we got to him, having never moved. Despite that, I’m not sure I’d take the same shot today if it were presented. Perhaps I no longer feel the need to, as I might have back when I was a much less seasoned hunter. Experience has taught me that too much can go wrong in such a situation-not to mention the fact few animals can travel as far, or as quickly, as an ells can when wounded. No, I’m far more impressed by the hunter who tells me he snuck in to within 75 yards of a herd of elk, or never shoots at running game or at any animal beyond 150 yards. This is the hunter I admire, for he clearly understands that undisturbed game and cool-handed marksmanship should be the rule, not the exception. This is the hunter who believes that 20 bullets can equal 20 deer, and he’ll wait to shoot only when he’s extremely confident of accurately placing a bullet. So, where on an animal should we try to place our bullet to ensure a one-shot, clean kill? There’s no denying the surest fatal shot is to the brain or spinal column. Either will put an animal down almost instantly, and result in very little ruined meat. Under most circumstances, however, this is not a shot I would recommend. For starters, the brain is a relatively small target, and even a narrow miss can result in a broken jaw, lost eye or other similar wound that condemns an animal to a most unpleasant, slow death. I once shot an antelope sporting a fresh bullet wound through the bridge of its nose. Whether the hunter who first hit it was aiming for the brain, I can’t say for sure, but the buck was clearly laboring, almost choking on blood, and would have suffered considerably had I not come across it. Neck shots are equally uncertain, as the spinal cord must be severed to ensure instant death. Miss by even a little bit, and you’ve probably got an animal with a muscular wound from which it will likely recover, but not without considerable agony. In the worst-case scenario, you may sever the trachea-the animal will likely escape, but suffer a lingering demise. When neck shots don’t connect directly with the spinal column, an animal will often drop to the ground almost immediately but quickly recover and run off. If you shoot an animal in the neck whether by design or by accident-it’s therefore important to keep a close eye on it until you’ve confirmed it’s down for keeps. Head and neck shots do have their place in the right circumstances, but they should only be taken at close range by capable shooters who know their quarry’s anatomy. They’re also acceptable in the rare event of an emergency, when a dangerous animal needs to be brought down in a hurry. Some hunters prefer shoulder shots because they will disable game while also inflicting fatal damage to the heart or lungs. Even when no collateral damage occurs, a broken shoulder, or two, will bring down an animal, rendering it helpless. In my opinion, this shot should be reserved for dangerous game, particularly bears. While some hunters use shoulder shots on larger animals such as moose and elk, I find the resulting dispersal of bullet and bone fragments ruins too much meat. Having shot a whitetail through the shoulder last year, I can speak first-hand of the meat that was wasted. Another thing to keep in mind when considering the shoulder shot is that if you shoot too high or too far in front, you’ve got either a clean miss or an animal with agonizing wounds. And if you shoot too low, you’ve got an animal with a broken leg that can still escape, only to later succumb to its wounds or predators. The heart shot gets a lot of attention, though I suspect most hunters don’t actually realize just how low in the chest the heart lies in big game. While no doubt fatally damaged if hit, the heart offers a small target, and is often covered by the upper leg. There’s little room for error: too far forward and you’ve got a non-fatal brisket shot; too low and you’ve hit muscle or broken a leg, with no expectation of quickly recovering the animal. And if your bullet strikes too far back, you’ve got a gutshot animal. The only practical room for error is if you shoot high and take out the lungs. While many believe the heart shot is almost instantly fatal, most experienced hunters will tell you that a heart-shot animal typically travels farther before collapsing than one that has been lung-shot. 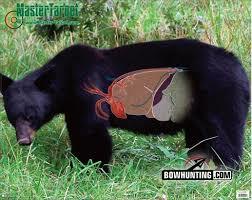 I believe the lung shot is the appropriate shot for 90 per cent of the big-game hunting situations in Canada. First and foremost, a bullet through the lungs results in an almost certain one-shot kill. In most cases, the animal won’t drop on the spot, but seldom will it travel more than 100 yards or so before falling over; the damage a modern bullet does to the lungs is that devastating. 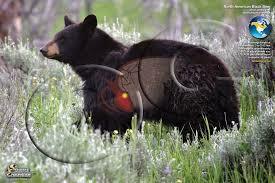 The lungs also offer a relatively large target, bigger than any other assuredly fatal zone on a game animal. This allows for a fair margin of error. Shoot low, and you’ll take out the heart; a bit high and you’ll sever the spinal column. Too far forward and you have a debilitating shoulder shot. Only when you shoot too far back do you have a problem-animals shot in the paunch typically suffer lingering deaths, and if you do happen to recover one, you’ve got a heckuva mess on your hands when it comes to field-dressing it. If you shoot just a little too far back, however, you may get lucky and strike the liver. Animals hit in this vital organ tend not to go too far before lying down. While we all prefer broadside shots, as often as not we face shooting opportunities from an angle. You still want your bullet to enter the chest cavity, however, so it’s important to visualize the path your bullet must take. With an animal quartering toward you, your target should be somewhere between the base of the neck and the point of the facing shoulder. If an animal is facing you directly, the centre base of the neck is the preferred target. The more difficult shot to visualize is when an animal is quartering away. Take your shot with the intention of breaking the far side shoulder and you’ll generally send your bullet through the desired lung region. 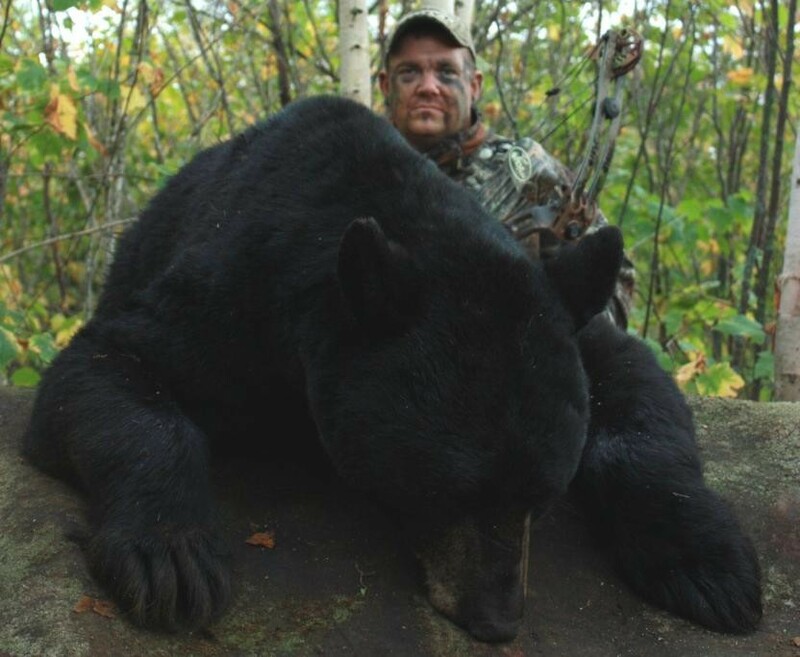 Be aware that the tendency in this situation is to shoot too far back, resulting in an unwanted paunch shot. I recommend not shooting when animals are quartering away at extreme angles or facing directly away from you. While we all know the old “Texas heart shot” through the behind can be fatal, the odds are your bullet will break up or deflect on contact with bones, impeding its ability to get into the vital organs. I know some may disagree, but this is one shot I simply won’t take, and I advise others to follow suit. If you absolutely must tale this shot, at least be sure to use a well-constructed bullet designed for maximum weight retention and penetration. Remember, when it comes to shot placement, the goal isn’t simply a freezer full of meat it’s also to get the job done quickly and efficiently.